SAN DIEGO, Jan. 16, 2018 /PRNewswire/ -- MyDx, Inc. (OTCQB: MYDX), a science and technology company and creator of MyDx® (My Diagnostic), the first multi-use handheld chemical analyzer designed for Cannabis professionals and retail consumers to understand the chemical profile of cannabis with how it makes them feel and which ailments it alleviates, today announced a definitive agreement and statement of work with a contract research organization to commence clinical trials in Israel on its proprietary pain management formula that was derived from 50,000+ pre-clinical, crowd-sourced physiological data-points tracked by MyDx's Handheld Cannabis Tester and associated mobile app. Israel was chosen for its ability to fast track studies through the FDA as well as its expertise in the cannabis field. The study will be conducted in one of the leading hospitals in Israel, and will be overseen by the Israeli Ministry of Health. 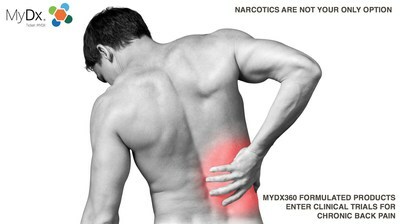 MyDx's Biopharmaceutical Division, which is focused on identifying green Active Pharmaceutical Ingredients (gAPITM), will conduct a randomized and placebo-controlled trial to estimate the efficacy of MyDx's proprietary formulas on patients suffering from chronic Low Back Pain as a Primary indication. The trial will also track Sleep, Depression and Anxiety as Secondary Indications. Formulas were derived from MyDx's proprietary database of pre-clinical, crowdsourced inputs that tied user experiences to the chemical makeup of a particular strain. "Our data gives us amazing insights into how the chemical properties of cannabis impact our base of users," said Daniel Yazbeck, CEO of MyDx. "Now we're taking those insights into the pharmaceutical arena to confirm our preliminary findings." "Cannabis holds so much promise for various categories of pain," continued Dr. Jessica Peatross, Chief Medical Officer of MyDx. "I'm personally very excited to pursue follow on studies that explore the activation of CB1 receptors to treat endometriosis, which is a painful condition that plagues 1 in 10 women in the USA today," concluded Dr. Jess. MyDx initially intends to find a pain management solution for people suffering from chronic pain, since pain is the number one ailment its consumers are seeking to alleviate with cannabis. When clinical trials are near complete, MyDx expects to conduct additional trials for its MyDx360 customers on various other areas of interest as well as the next most prioritized ailments in the company database as indicated by MyDx users. Clinical Trials for its pain management solution will begin on or around March of 2018, and should be completed by Q3 2018, with periodic updates on the status of results leading up to the completion of trials. The Primary Objective is to compare the efficacy, as measured by the assessment of the level of back pain, of MyDx formulated products patients with chronic neuropathic back pain. Validate the efficacy of MyDx360 Delivery Mechanisms such as the Thin Film Strips used in the study. Ultimately, MyDx expects to gain insights from the controlled environment, overseen by a credible team of experienced scientists and doctors, that it can use to substantiate the safety and efficacy of MyDx360 Formulation Products. With limited options to treat pain of such specificity, cannabis-based products may yet provide another complimentary (or separate) means to alleviate that pain. MyDx intends to confirm so, with the commencement of its clinical trials.